Happy St. Patrick’s Day! Did you know that Saint Patrick is the patron saint of engineers? I am an engineer and at the engineering school I attended they always made a really big deal out of St. Patrick’s day. The school president would wander from classroom to classroom and cut the ties off of the professors. If your professor got his/her tie cut off, then class was over! It was a little strange, but the students always liked it. Anyway, who is going to celebrate with a Guinness tonight? Well, if you do, enjoy one for me too! I’ll be at home working on getting Brooklyn Bridge ready for Protospiel-Milwaukee. More on that below. At my local grocery store I noticed this new brand and chatted with the fine elderly gentlemen that runs the beer portion of the store. It is a Wisconsin beer company and they make “blended” beer. For example, the Sibling Rivalry is a blend of an Amber, a Red, and a Brown ale. But don’t worry, if you drink one it still only counts as consuming one beer! I thought it was actually quite tasty. My initial worry was that they must be bad at making good beer and so they figured they would blend it because then no one would know whether it was good or not. But at a recent game night someone mentioned that three bad beers can’t be blended to make a good beer. And I thought it was a good beer, so they must be good at making beer. If you see this or their other three styles at your local store, give it a shot! NEW! Tommyknocker Cocoa Porter Winter Ale: I enjoyed this cocoa porter from a brewery that I had not previously heard of. They have a few others varieties I’d like to sample. NEW! Tyranena Down ‘n’ Dirty: This was a very enjoyable chocolate oatmeal stout that was neither too heavy on chocolate nor oatmeal. I’d enjoy another one. I finally got Playtest #1 out of the way. That’s always a huge barrier and it has been vanquished. Brooklyn Bridge is a time-based worker placement/resource management game about building the Brooklyn Bridge. In the game you have a small crew of workers that will need to collect and use resources to build the bridge. The crew that contributes the most to completing the bridge will be the winner. The design is currently set for 2-5 players. It took my friend Adam and I 2.5 hours for the first playtest. That is much longer than I anticipate a final version to take since we were discussing a ton of things and playing relatively slowly. The bottom line, though, from playtest #1 was that the game worked, nothing seemed broken, it included some very interesting choices, and it seemed fun. So I am VERY pleased with how it went. Forbidden Island x3: This is not a new game to me, but it was new to my kids (ages 4 and 2). I thought I would see if they liked it and they totally did. They kept asking me to play “the island game” with them. The strange part is that we won all three games that we played. That almost never happens! I’m just glad they enjoyed it and I hope it serves as a gateway to get them playing some more awesome games. NEW! Curling: Jeremy, the maker of the crokinole board and guest post writer from last week also made a curling board. You can check out a picture of it in my tweet here. It was a ton of fun to play even though it took a while to figure out how hard to slide the discs. It will be even more fun when we get good at it. NEW! Tessen: While I had previously played a demo copy, taught by the designers Chris and Suzanne Zinsli, this was my first play of my final production copy. This game is really enjoyable, fast-paced, and fun. I beat my sister in three straight games. Tip the Cows: If you have ever played Pass the Pigs, then you know how to play Tip the Cows. It’s basically the same game but with cows instead of pigs. It’s a fun little press your luck game where you get to roll cute animals. 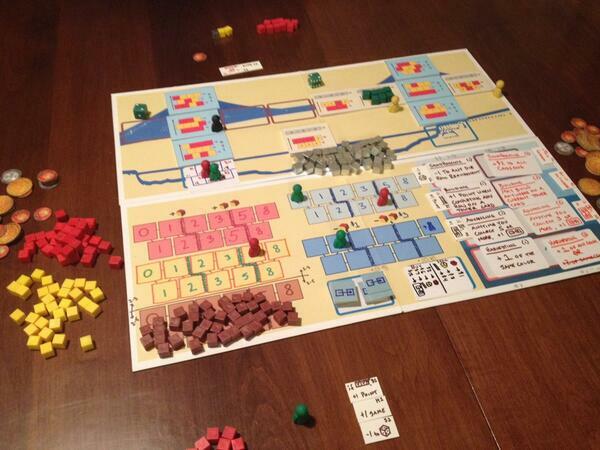 So Brooklyn Bridge Playtest #1 went well… what’s next? I have already redesigned and made a second prototype board based on the results from the first playtest. Normally I don’t like to change things until it has been played a bunch, but due to the weight of this game and the obviousness of some of the necessary changes I don’t see any reason why I should postpone integrating the changes. I am very excited about this game and I’m hoping to test it two more times this week so I can tune it a bit before Protospiel-Milwaukee. I think it has a lot of potential and I can’t wait to get it in front of more players! So those are the Boards & Barley I enjoyed last week. What did you enjoy? Did you play anything for the first time? Any new brews? Posted on March 17, 2014, in Brooklyn Bridge, Monday Brews, My Games, The Barley, The Boards and tagged 4 Brothers, barley, beer, blended beer, board games, boards, boards & barley, Brooklyn Bridge, Monday Brews, Protospiel-Milwaukee. Bookmark the permalink. 3 Comments. I’m eager to try out Brooklyn Bridge at Protospiel after having such a great time playing Scoville last summer! Fair warning Glenn… Brooklyn Bridge is in its infancy compared to how Scoville was when you played it. Thanks for your interest, though. I’ll be happy to teach it to you!